eat run sail: Please, Make the Noise Stop! A slight change in plans today. Last night I painstakingly mapped out a 6 mile route that I wanted to run today. And I was excited about it. I drank extra water during the evening to make sure I would be well-hydrated for it (and got up twice during the night!) and I dreamed about it. But today when I got up, my confidence was shaky. I was concerned that my quads might fail me when I was 3 miles away from the house and I would have to hobble home... after the 3 hour bike ride yesteday, they were like jelly, and although they felt okay this morning, I was worried about them. I decided that 6 miles is pretty much the same thing as 10 km so I decided to run my recent 5km route twice. That way I would never get too far away from the house and I would still accomplish my distance goal today. I could run it once and then change direction and run it the opposite way so it would seem different. hey buddy, don't you see me? stop backing out of your driveway... and hey, you aren't supposed to talk on your cell phone while you're driving anyway! oh the water spouts just came on, that kid is gonna freeze! which door is the Ladies? don't stop thinking about tomorrow... who sang that? Fleetwood Mac, I don't like Fleetwood Mac, why did I think of that song? I finished my 10 km (which I discovered is actually 6.25 miles) in 87 minutes and was thrilled to be feeling so good at the end. I came in and made the best smoothie ever to drink while I stretched. 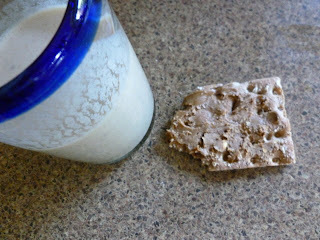 And I slathered some more Almond Butter on a Wasa cracker.... lovely. And NOW I am feeling my quads. Do you have this kind of noise going on in your head when you run alone? All the time I have "noise" in my head but I try to create pleasant noise:) LOL!! The chatter is still there with the MP3 (IPOD) only you add in a few lyrics here and there. I like the music because it helps pace me. The chatter in my head, helps me destress as I replay situations, or reherse the future. And then I have those random thoughts too. It all serves to distract me and I'm done before I know it. If I focus on the time, pace, or distance I get discouraged so i don't look at my garmin until I'm finished. Glad you enjoyed your run. Awesome job!! I never run with music so yes - I often have this type of chatter in my head. Sometimes I just have to stop and remind myself to enjoy running again! I originally started running without music because I welcomed the opportunity to think and not be distracted - sometimes I think I might need to distraction from my own head! I always have conversations with myself when I run! I used to listen to music but like you, I take way too many things with me when I go out for a run. Plus, I always forget to charge my ipod! definitely have chatter! usually even with music. this summer it has been frustrating chatter but when i am really into the run i can normally just use it as a positive and encouraging chatter. you are amazing for conquering your run after such an amazing bike ride!